Baked, fried, mashed, boiled, roasted, hashbrowned, french fried... you name it. A while back, I shared my leftover mashed potatoes Potato Soup recipe. Well, I have another recipe to use up leftover mashed potatoes, so I thought I'd share that with you too. One thing I like about potato patties is that they are very versatile. You can add in different spices and ingredients to make them fit your meal. Are you making them for breakfast or brunch? I highly recommend crumbling some crisp bacon and mixing it in! I'll bet they would be great alongside some biscuits and sausage gravy, too! Looking for a lunch or dinner accompaniment? Add some herbs or sauteed, chopped veggies (zucchini, bell pepper, broccoli, etc.). You know, something that will compliment your main dish. 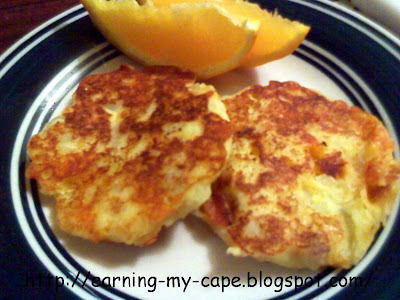 Potato patties are really easy to make too, so that is a bonus! Now grab your ingredients and a good nonstick pan or a well seasoned iron skillet and let's get started. Heat your pan to medium- medium high, and toss in your butter or bacon grease. Add your onion and saute it until it is tender. In a medium sized bowl, mix together your potatoes, egg, cheese and your cooked onion. Once it is well mixed, form it into 12 golf ball sized balls. Flatten each to about a half an inch thick. Add a little more butter or grease or oil to the pan and place the patties in the pan. (You may need to work in batches). Cook for about 4 minute on medium- medium high heat. Flip and cook another 4 minutes. What do you like to add to your potato patties? What do you like to serve them with? Oh yum! My mom used to make potato patties sometimes. The cheese sounds like it would make them even better! I love anything with cheddar cheese! Bacon and cheddar? Even better! Potatoes and cheese,two of my favorite things :) Thanks for sharing! Thanks Steph and Sunflower Patch! These look delicious! My guys would love them. that looks so delicious! will give it a try. thanks so much for visiting my blog and for your lovely comment on my bracelet DIY. got me to visit you. Sharla, I hope you like them! There isn't a doubt, everyone in my family would love these, especially me.